AIMS Stress Free Trading: Do You Feel Betrayed? Has your trading strategy been not working up to your expectations recently? Has the market been unfair to you lately? 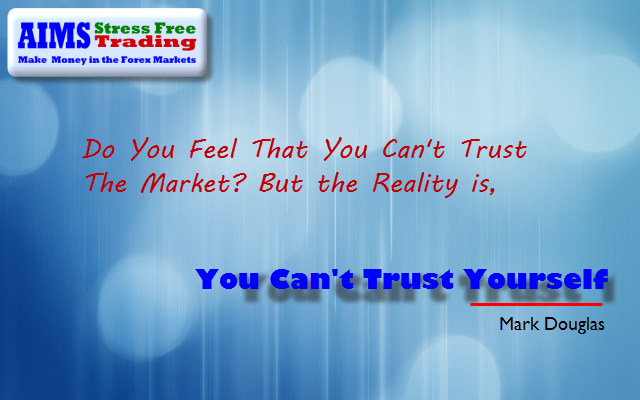 Do you feel Betrayed by the market or your trading system? If you do, and I know most of us experience those feelings, let me ask you a question. Do You feel the same way when you toss a coin? You called heads but its tails,do you feel betrayed by the coin? If you are playing a slot machine and time and time again you don't get what you want do you feel betrayed by the machine? I'm sure your answer is absolutely not. When the pattern shows up, e.g. S1 Setup, you have to take it just like you're willing to flip a coin. "trading a technical pattern like ours has nothing to do with being right and wrong, this is not a right or wrong game" its just an odds game. Trading a technical pattern is exactly that. It gives you odds in your favour but not per "attempt" or "trade". Odds in your favour, what does it mean? And the odds in your favour are not per trade. You have to understand this, that you have odds in your favour over a series of trades not per trade. Traders often mistakenly think that when the "pattern" e.g. The Setup 1 presents itself that they get odds in their favour which means "I will win the next trade because its a GOOD Setup". The reality is that Setup 1 or any other pattern, The Fruit or Seed, Trend lines or whatever repetitive pattern you've found in the market is just that, a pattern that repeats itself. A pattern is a pattern. It does not give you an edge in terms of your ability to win this particular trade or your next one. However it does give you a edge , it gives you odds in your favour in terms of your total winnings be more than your total losses. It means that at the end of a series of trades your overall balance will be positive. But this largely depends on your ability to stick to the plan. You cannot count trading mistakes, which means not following your rules, in this series of trades. How sure am I if I will win my next trade? Traders often mistakenly believe that their method is telling them that the next trade will be a winner that their method is telling them what's going to happen next? I cannot guarantee that, i cannot even have any idea so that I could tell at all, whether my next trade will be a winner or a loser. I can say with certainty that if you follow this pattern at the end of 20 or 50 trades your overall winnings will be more than you've lost. This is Trading. Trading is a pattern recognition numbers game. Its Easy to Trade, Its easy even to find a good winner, everyone finds a winner every now and then, however its not easy to make consistent gains unless you've addressed the mind issue which is "Fear of Trading". Unless you've understood the fundamental fact about trading. Trading is an odds game and you have to play by the rules. Unfortunately our fears in our minds always block our way towards consistent success. If you're scared, if you're not making money, you've got to get this eBook. Previously only available to Premium Members inside AIMS Forum now available to download right now.